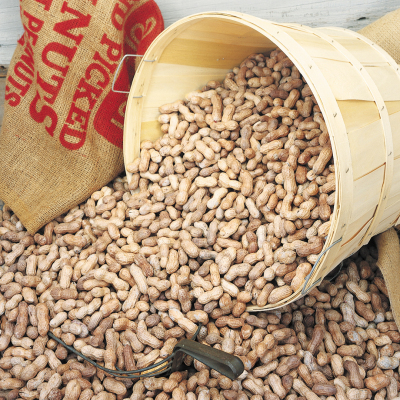 Our Jumbo Roasted-in-the-shell peanuts are packed by the peck… 5 lbs. in authentic country baskets. A fun and nutritious snack for all ages. Salted. Continental US only. Best if eaten within 30 days. Keep these peanuts fresh longer by refrigerating or freezing them. Bulk item. Ships in own box. Must ship standard or expedited. Additional $5.00 charge applies. Available to ship within the Continental U.S. only. Ships separately. Always consistent, always good, prompt shipping! Great products matched with great service! I just finished my first order of these fine nuts. They taste just like the ones at Texas Roadhouse restaurant. Placing my second order now. 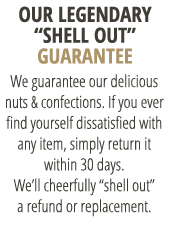 Excellent salted in the shell roasted peanuts. Absolutely a hit with the family! My husband says these are the BEST peanuts and I have to agree...plus fast shipping! The web site was easy to use and the order placed was handled in the usual manner with promptness and efficiency. The product arrived in very good time in perfect condition and freshness. No complaints. The basket of peanuts and the butter toasted peanuts are outstanding. Ordered directly from Virginia Diner after purchasing at the MDen in Ann Arbor. So crisp and delicious. Delicious peanuts in a peck basket that delighted our friend who received the gift. Great tasting peanuts in an authentic peck basket. Smiles all around. Excellent service via phone calls to your staff tracking and delivering my products on time, just before Christmas.